Best known for The Protestant Ethic and the Spirit of Capitalism, Max Weber (1864-1920) was one of the founders of modern sociology. 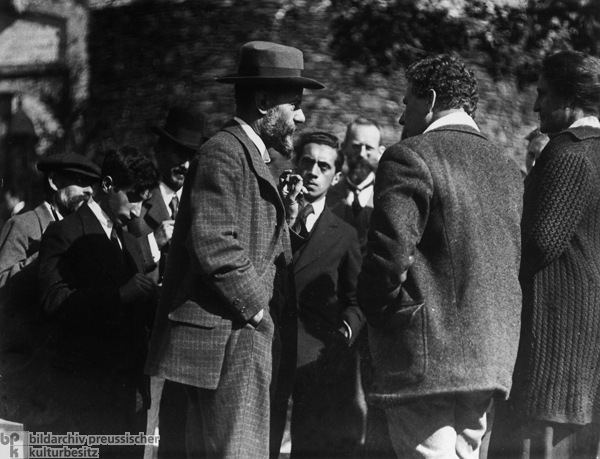 Here, we see Weber (with hat) at a conference in Burg Lauenstein (Thuringia) in 1917. It was at this important meeting that Weber met a number of leftist artists and intellectuals who supported pacifism at a time when Germany was mired in the First World War. One of these intellectuals was Ernst Toller, who appears in the center background of this photograph. A poet, Toller went on to organize a strike among munitions workers in Munich in 1918. When he was arrested for his role in the strike, Weber came to his defense.